A perfect vibrant crunchy topping for your Mexican treats, done in minutes! Whenever I make any Mexican food I crave one topping in particular – crunchy, sweet and sour red onions! They are also known as ‘Cebolla morada’ in Mexico. It doesn’t matter if you put them on your tacos, chicken mole or your regular old hot dog – they are delicious and create a lot of contrast! The vibrant color will catch the eyes of your guests immediately! The contrast of sweet, sour, salty with a hint of sharpness from the onions puts the taste buds into high gear and because you barely cook the red onions they keep their crunch. This makes for a nice texture contrast in your dish as well. And you know the best part? You can prepare this delicious boost for your dish in 2 minutes. After that it’s just a little waiting time. The thin purple edge of from the red onion dyes the water and the water consequently colors the white part of the onion into a vibrant purple! A neon-feast for your eyes and your taste buds alike! This topping is super easy to make and absolutely delicious! Give it a try and push all your favorite foods to the next level! 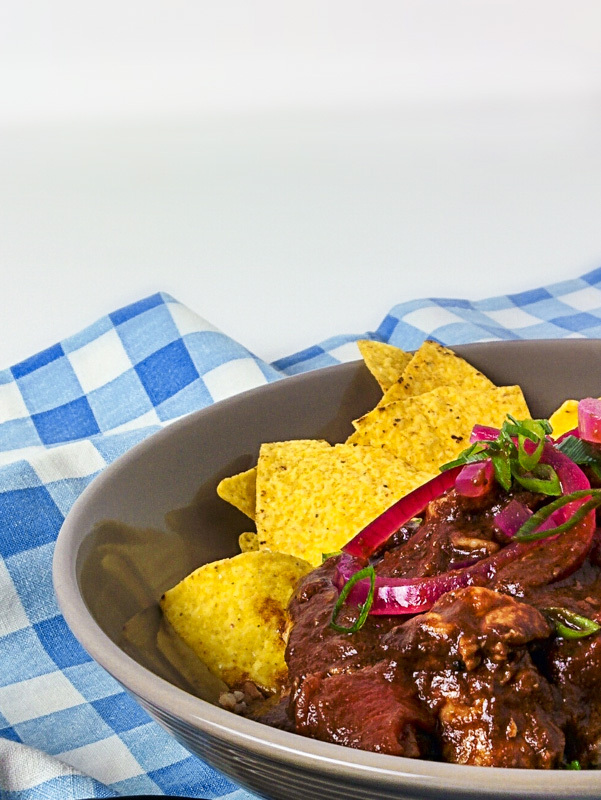 Mexican chicken mole topped with vibrant pickled red onions. Look at that color! Cook some liquid and cut an onion. Done! Pour vinegar and water in a small sauce pan. Add sugar and salt and bring to a boil. Meanwhile peel and halve the onion, then cut into rings. Once the liquid comes to a boil, add onion rings. Give a good stir to make sure all onion rings are covered. Cook for 1 minute and then turn off the heat. Let stand for 15-30 minutes. Pour off the cooking liquid and use your onion rings as delicious topping on your favorite (Mexican) foods! Let us know what you think of this topping! Have you ever tried pickled onions before? Do you think the onions would benefit from some other additional spices? Share your recommendations in the comment section below! Next Post Looking for culinary travel inspiration?